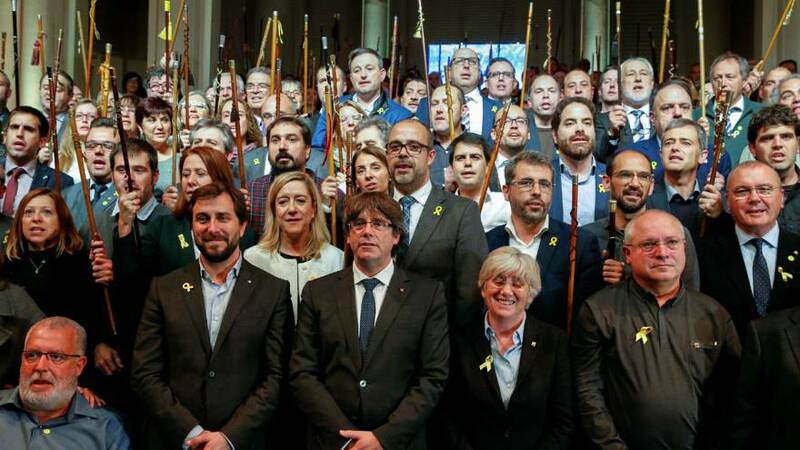 Chanting freedom, two hundred Catalan mayors have taken their fight for independence to Brussels. They rallied together and took to the streets, calling for continued non-violent resistance and for the EU to intervene. Addressing them, Catalonia’s deposed leader questioned whether the bloc will respect the outcome of the regional election called for December. “Mr. Juncker, Mr. Tajani, will you accept the Catalan result or not. Because if the result is that Catalans will continue to support a government, a parliament, a democratic choice to become an independent state, will you forbid them? Is that right?” asked Carles Puigdemont. Puigdemont went into self-imposed exile in Belgium last month, after Madrid fired his administration, dissolved the parliament and called the December election. Pro-independence parties want that vote to become a de-facto referendum. “We need Europe to listen to us and to tell the Spanish government that this is enough. It cannot do anything else, it has to leave Catalonia to self-determine and govern itself, and decide what it wants to be,” commented Maties Serracant, the Mayor of Sabadell. While the mayors were outside in the cold, Catalan business representatives were in the European Parliament in Brussels. They want Catalonia to stay in Spain, with companies said to be fleeing the region. “We are seeing a very paralysing moment: the economy is kind of paralysed. We cannot go on like this, we cannot have an irresponsible anti-democratic government like the regional one that declared themselves above the law. So, anyway, nationalism and populism is bad for business,” said Carlos Rivadulla, Vice President of the Empresaris de Catalunya organisation.